A great alternative to a Sunday roast. This whole baked cauliflower looks stunning and the crispy leaves are delicious. Why let them go to waste? 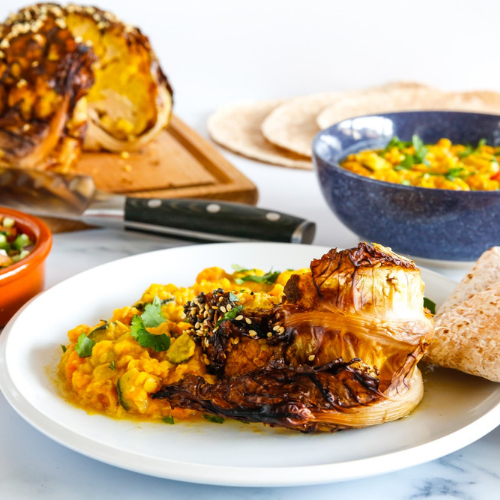 Serve with this courgette and squash dahl, kachumber salad and chapatti. Mix through some leftover chopped up cauliflower and let it down with a bit of water to turn it into a soup for lunch. Any leftover dahl freezes well, and the cauliflower can also be frozen to be used as the basis for a curry with squash, carrot, chickpeas, lentils and spinach, for example. First prepare the cauliflower by removing or trimming any outer leaves which aren’t nice. You want to keep the leaves on for this recipe. Carefully gouge out some of the core from the bottom of the cauliflower to help it cook. Melt 1/2 tbsp coconut oil and mix in the ground coriander, cumin, turmeric, chilli and some salt and pepper. Rub the mixture all over the cauliflower. Place in a baking tin with 125ml water in the bottom, cover the tray with tin foil and bake for 1.5-2.25 hours until soft. You can test this by sticking a knife or skewer into the core. It should go in and out easily. Remove the foil, turn up the oven to 180C and bake for a further 10-15 minutes until the leaves are crispy and there is a deep colour on the cauliflower. Just before you’re ready to serve, heat the rest of the coconut oil in a small frying pan. Once hot, add the cumin seeds, mustard seeds and sesame seeds and heat until the start to crackle and the sesame seeds start to turn golden. Transfer the cauliflower to serving dish and pour over the tarka. Serve slices with the dahl, kachumber salad and a chapatti. Put the lentils in a large pan with the water butternut squash and turmeric. Bring to the boil then reduce to simmer for 30-40 minutes until the squash is soft and the lentils have broken down. Add more water if you need to. Season with salt, turn off the heat and set aside. Heat a frying pan and add the coconut oil. Once hot, add the cumin seeds, curry leaves and dried chillies and cook until they start to crackle. Tip in the onions and courgette and cook until the onions are a deep brown and the courgette has released its moisture and turned brown. Add the garlic and ginger and cook, until the raw smell of each has gone. Finally add the tomatoes and cook for a few minutes before tipping the whole lot into the lentils. Stir well and taste to see if you need to adjust the seasoning. The dahl will sit happily in the pan taking on the flavours of the tarka until you’re ready to eat. Warm through when you’re ready to serve and then stir in the coriander. Mix all the salad ingredients together in a bowl and set aside until you’re ready to serve.